The Yeast Face Masque from The Skin Shop is an unusual and very affordable product, which is said to have anti-acne properties. 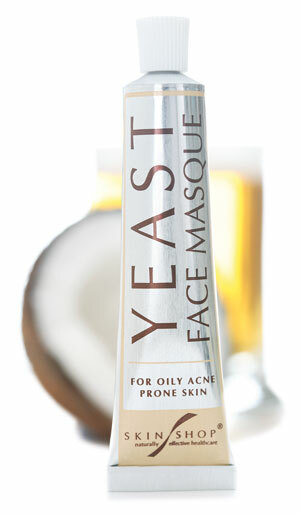 This is attributed to its yeast content, and in support of this, The Skin Shop cites a study involving 139 patients, where those using a skin cream containing live brewer’s yeast achieved substantial and statistically significant improvements in their acne when compared to those applying a placebo treatment. The company also say that the masque is “made from concentrated levels of beer hops”, adding that hops are known to have strong anti-bacterial actions on the skin. The ingredients of the product are given on the tube as follows: water, kaolin, alcohol (denat), coconut oil, glycerin, yeast extract, cetearyl alcohol, olefin sulphonate, phenoxyethnol, colour E110. We are a little confused by this, because beer hops are absent from the listing, and ‘yeast extract’ is clearly not the same as ‘live brewer’s yeast’ – although one of our testers mentioned she was sent a sheet explaining that live yeast was present in the product. Our testers were Mica, in her early fifties, who has facial acne, Jacqueline, early forties, who has suffered from acne since childhood, and is always keen on seeking out natural remedies for the condition, and Dave, who has severe acne and spots. Mixed results and views from our testers, then. We are a little disappointed that there appear to be some labelling and ingredient issues which need to be resolved. The Skin Shop website does not give the product’s ingredients and gives little indication of how to use the product, and the accompanying online text at the time of this review maintains that it is an ‘extract’ of brewer’s yeast, not the yeast itself, which is in the product. If we receive clarification on these points, we’ll add a note to this review at a later date. Skin Shop’s Anti-Acne Yeast Face Masque costs £1.99 for 30ml. It is available from the Skin Shop site.